During a spring semester staff meeting, members of The Wabash Commentary, discussed ways to promote a sense of tradition and respect for the college among the younger classes, especially the incoming freshmen. 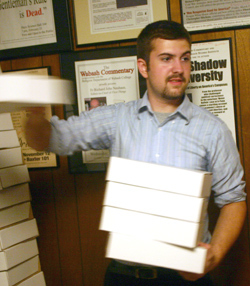 When several staffers mentioned the idea of mailing copies of books about Wabash’s history such as These Fleeting Years to freshmen, the editorial staff responded by getting busy on the project. Enlisting the help of the Dean of Student’s Office and the Office of Alumni and Parent Relations, they sought to send a free copy of the books to each member of the incoming class of 2010. After securing financial support from those offices, in addition to support of alumni donations, TWC set about ordering the necessary supplies. On Tuesday evening, staff members on campus and from surrounding areas, along with some friends, met, and amidst bites of pizza, set about to make the mailing a reality. The workers started the task and within a few hours had packaged and labeled the boxes for each of the more than 260 members of the class of 2010. That shipment will be in the mail this week and should be arriving in future student’s mailboxes in the coming weeks! The project is really a testament to the importance that Wabash men place in their shared experience. As Tom Runge ’71, Director of Alumni Affairs wrote in the cover letter, "Wabash is a College steeped in tradition. Understanding these traditions will, in many ways, give you a head start on your Wabash experience." We hope that members of the incoming class will enjoy these books and come to campus in August with a little greater appreciation of what makes this place so special. To learn more about the project, feel free to contact TWC Editor, Brandon Stewart at editor@wabashcommentary.org or 765-362-5624. Top right: Justin Liedel, Josh Bellis, Ben Tritle pack up the books. Lower left: Stewart stacks the packages for mailing.